Perfect Cut is a Certified Pest Control Company – License # JF111401. 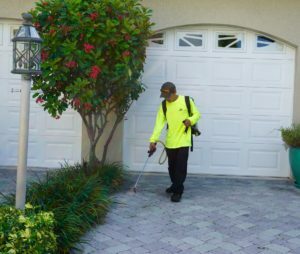 We offer all exterior pest treatments including white fly treatments, lawn insect treatments and Integrated Pest Management & Prevention. Our Integrated Pest Management allows for a non-toxic, granule pest prevention program for your grounds. We are also a Certified Florida Green Best Practice Operators – License # GVZ1710-1. We offer a full line of lawn, shrub, and botanical fertilizers and weed control management services for our commercial clients and estate homes.